Now available in one of 3 new personalization styles! 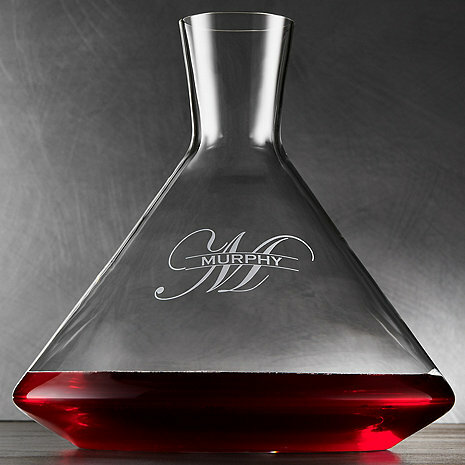 ZENOLOGY is peace of mind knowing that you're buying some of the highest-end glassware in the world at half the price. Brilliantly lightweight and elegant, ZENOLOGY glassware is handcrafted and mouth-blown in the same European factories as other well-known brands. Designed exclusively for Wine Enthusiast, we've erased the usual high-end luxury brand markup and passed the savings on to you. That's ZENOLOGY! In the unlikely event your ZENOLOGY Decatner breaks, we'll replace it FREE, even up to 10 years after purchase! Click here for details. Had our 1st use Last Friday night with several friends. The decantor was a hit along with the stem ware. Would recommened to all. Arrive as scheduled and packed for shipping to the ends of the earth.